Since the beginning, at KRION® one of our greatest concerns has been to provide our clients with the endless possibilities of the Solid Surface from PORCELANOSA Group, KRION®. The properties of the material make it ideal for all sectors, and for this reason we are launching a series of catalogues for specific sectors, beginning with HEALTHCARE. In addition to this, there will be catalogues for Hotels, Commercial Premises & Public Spaces, Home & Design, and Transportation. Along with the catalogue we are presenting a small A6 format folder, in which we show 3 of the colours that we recommend for each sector. With the concerns and suggestions of professionals as a starting point, this series of catalogues has been created, in which we try to resolve all queries which may arise about our material in each sector. 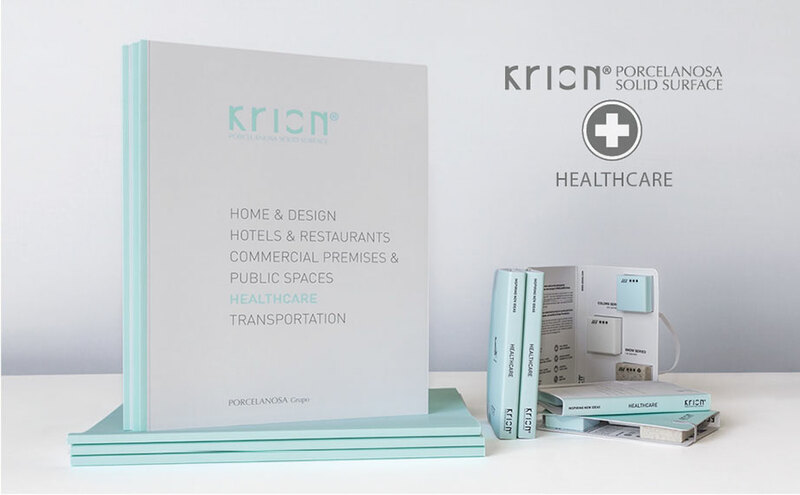 In the catalogue that we are presenting today, we especially highlight the properties of the material, how it is differentiated from other materials and how our material KRION® facilitates the lives of healthcare professionals. We are grateful for the collaboration of the professionals, who have provided their experiences, helping us to create a catalogue with high didactic content, along with the visual display provided by the images of projects created with KRION®. HEALTHCARE catalogue in PDF We hope that you like it!